A welcome letter is a much appreciated formal document that is sent to a newly joined member on behalf of an organization. It could be a new employee or a new student or a new customer and so on. While an introduction letter is the first point of contact between two parties while approaching for a business relationship, the welcome letter is the first formal document after the desired relationship has been made official between the two. You may also see Letter Samples. 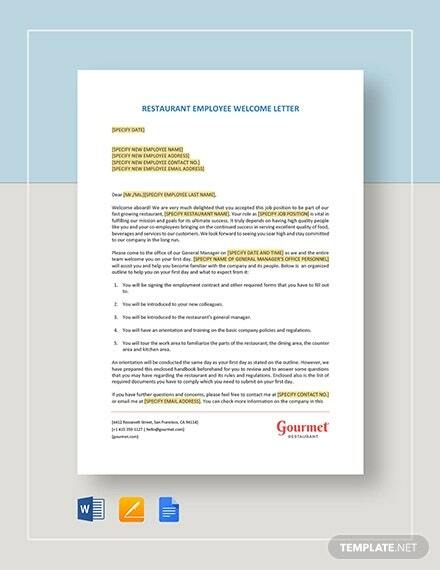 This welcome letter template shows how to format a letter when your office is about to welcome a new recruit to the organization. 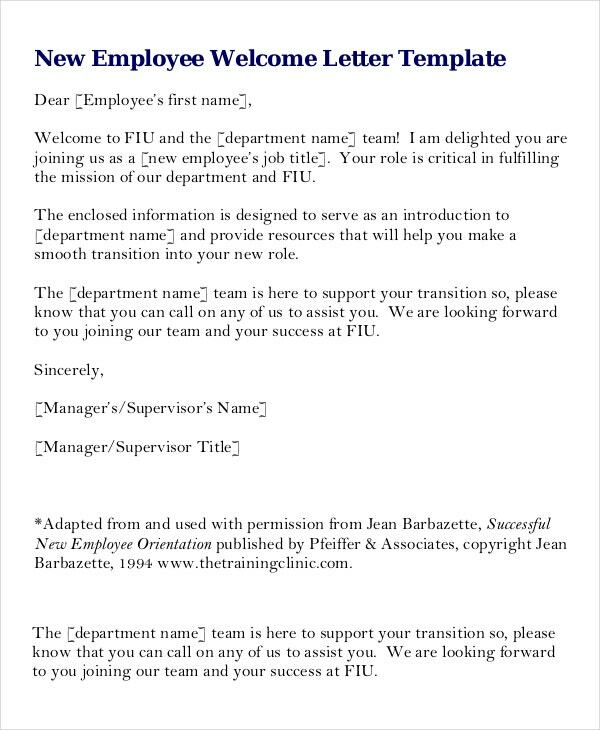 The letter clearly mentions the department of the new employee and the promise of the needed support by the company. The welcome letter sample presents a professional format of a welcome letter to be sent to parents on part of a teacher or a coach. The letter specifies the particulars of the course the student is into. 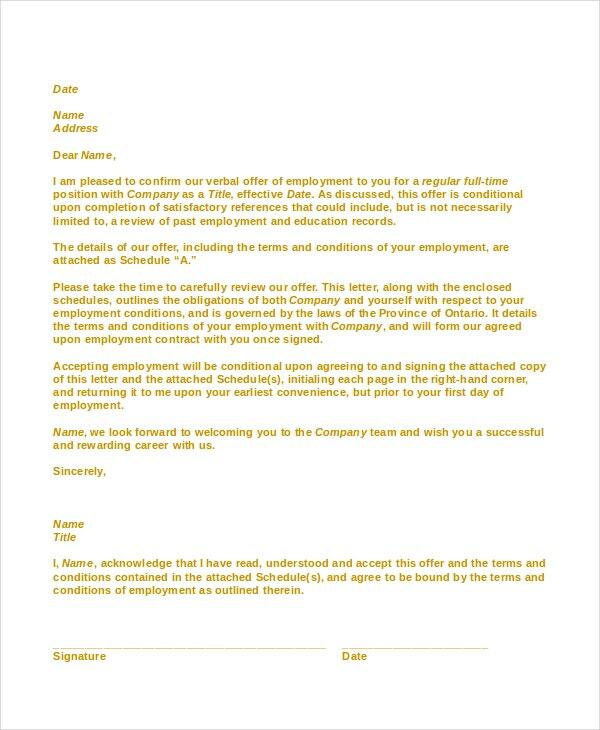 This welcome letter is sent by a company to a newly hired employee certifying that the person has been offered a certain position in the firm. The letter also urges the recipient to carefully review the terms of working with the company. 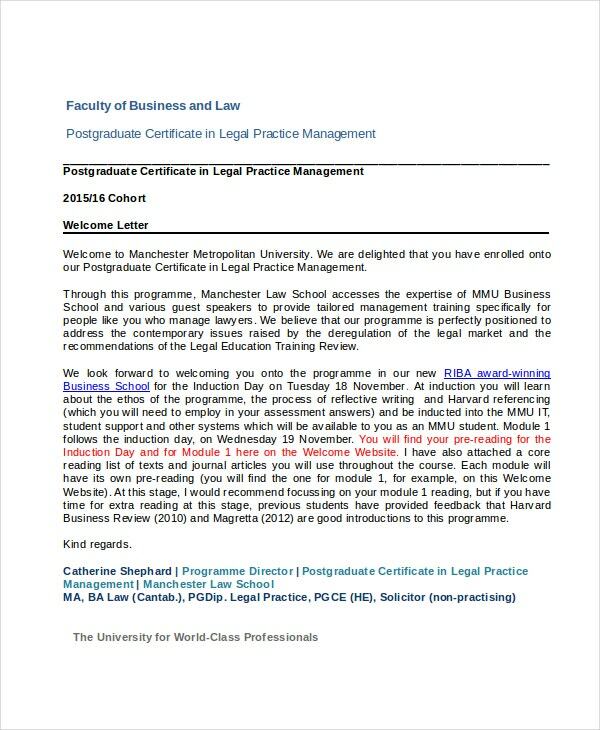 This business welcome letter is sent by a university to a student stating that the latter has been approved for a certain course in the institution. The letter also contains details of the induction day. 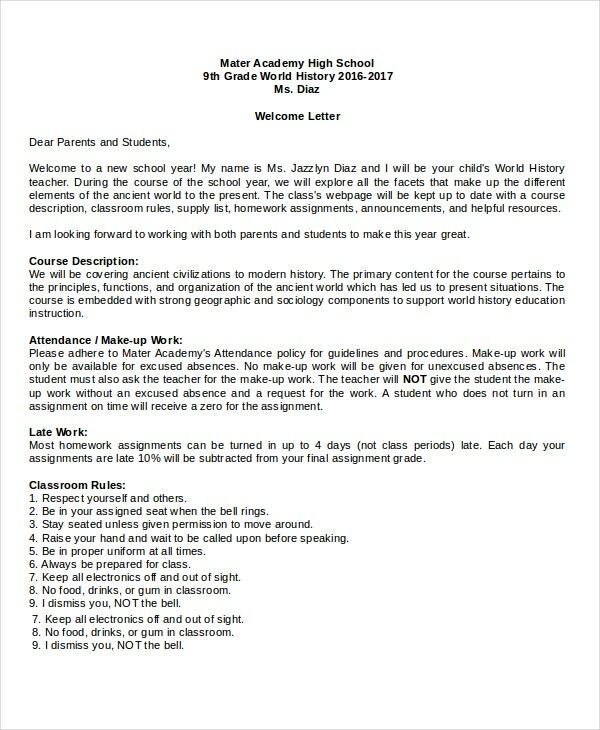 This teacher welcome letter is sent by a teacher to the parents of each student in the class in the beginning of a new session. 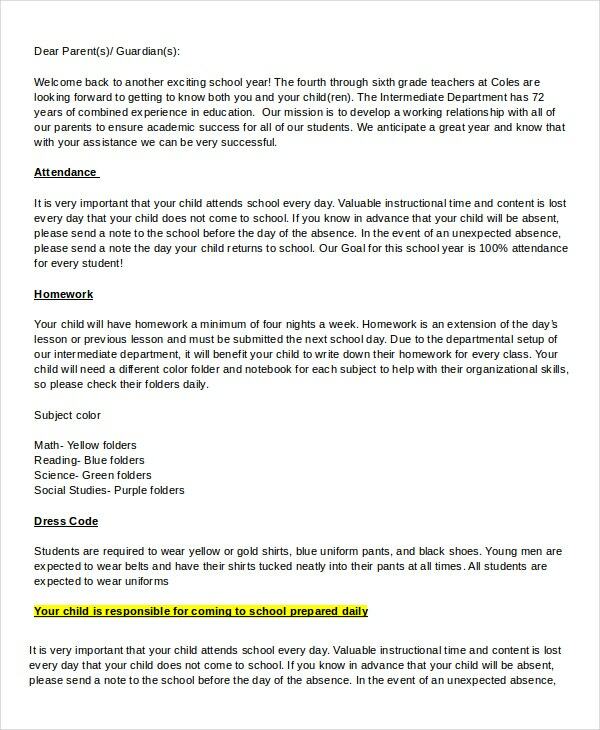 The letter details the course description, the homework rules, and other classroom regulations. > What is the Purpose of the Welcome Letter? The main purpose of the welcome letter is to offer a courteous touch to a new recruitment notification sent to a new hire on part of the hiring company. Such a letter makes sure that the candidate is being heartily accepted as a part of the institution, be it an office or an academic body. Then, apart from the welcome greetings, another major purpose of a welcome letter is to clearly specify the major details pertinent to the induction of the candidate- such as the department that he would be joining in or facts about Induction Day. 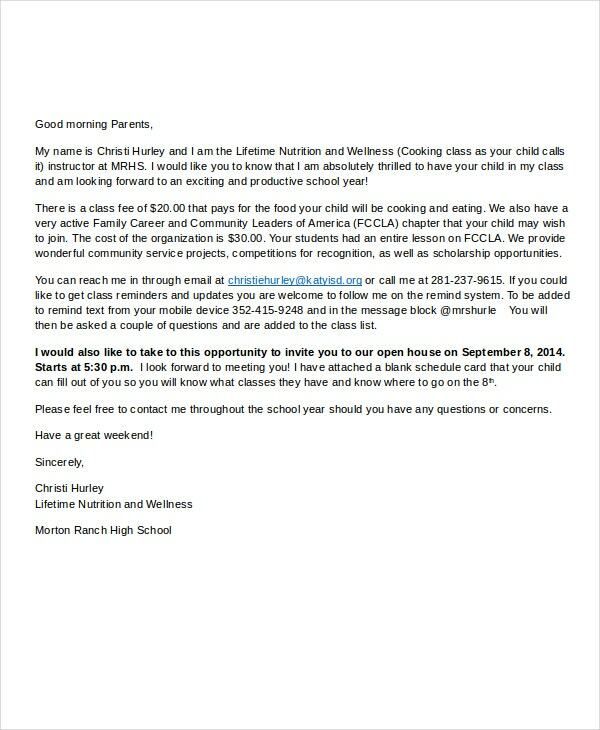 Welcome letters sent by teachers to parents might include relevant details about class rules. > Who needs a Welcome Letter? A welcome letter would be needed by anybody or any organization who is looking to send welcome greetings to a new member of the institute. Such letters are quite a staple for hiring managers whenever a new employee is recruited by the company. These letter templates are also required by universities as well when the institution has approved a student for some special course and looking to send the message official to the latter. Besides, the welcome letters are needed by school teachers too. Often, the teachers have to send welcome letters to parents, especially during the start of a new session. 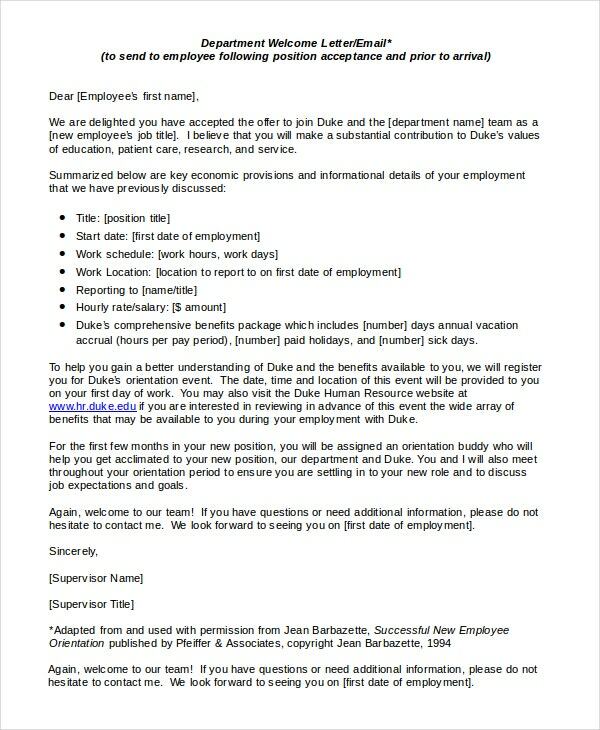 > What is the Benefit of the Welcome Letter? A welcome letter is a formal greeting that is sent when a new person joins an organization. The primary benefit of the letter is that it shows that the organization has readily acknowledged the new person under its wing. When a person joins a team, he is naturally little tensed about the new environment. Such a warm letter helps to break the ice for him by officially accepting him in the group or team. You can also see Formal Letter Templates. This letter also instills a sense of confidence in the person by making him feel that his presence is being appreciated. Besides, welcome letters are useful in the sense that most of them clearly specify the basic details of the new recruit- such as his department, whether he would be working full time or part time, etc. A welcome letter helps to make a person feel at ease in an organization that he or she has joined in. It is generally sent by the organization to the new recruit after the interview and thorough assessment of reference letters provided by the previous institution that he had been a part of.